Visiting Venice is an experience I wouldn’t have missed; travelling with a wheelchair user made it all the more interesting. From the travelling companion of the wheelchair user – not the wheelchair user himself. Considering a wheelchair user who can get out of the chair and stand up, with the support of another person, a stick, or wall, or whatever is close at hand. This wheelchair user can also walk a few steps with this support and even climb some steps. If the steps are too high or steep then his feet may need lifting. So ideally this wheelchair user needs to avoid more that one step. Considering a wheelchair user who needs a disabled bathroom and bedroom with hand rails, strong furniture that can be pulled up on, no rugs/mats or slippy floors, space to move around in, in a wheelchair, and a chair with arms. Venice, we knew before we even set out, is not wheelchair friendly. That must be why in four days we could count the number of wheelchair users we saw in a massively crowded city on the fingers of one hand and some of those were people with broken legs, or the elderly, who simply couldn’t walk far – not necessarily people whose lives were governed by their wheelchair – although who can judge from simple observation. Ideally your hotel should be in a position where there is no bridge (with steps) to cross to get into it. Ours could only be reached by crossing a bridge with steps, whichever direction we approached it from. When booking in advance, we couldn’t find a more accessible hotel, with a room available. But all over the world we have always encountered people more than willing to help. In total we crossed the bridge 8 times (leaving the hotel in the morning and only returning in the evening) and only had to climb the steps twice. On every other occasion a group of kindly volunteer tourists lifted the chair plus occupant over the bridge. Thank goodness for a light wheelchair user who watches his weight! Your hotel should have access with no steps (when we got over the bridge, there were no more steps to get into the hotel! ), a lift (yes), they should be expecting you in a wheelchair (no – they claimed to have no knowledge of this although we had a copy of the prior email communication) and they should have the promised walk in shower available (no – the hotel didn’t have any walk in showers, only showers over baths – impossible for our wheelchair user). But the hotel did provide a big room with plenty for space for moving around in a wheelchair. Normally, it’s ideal for wheelchair users to be centrally located, so that you can walk from your hotel to see the sights and not have to pay for taxis, which are not only expensive, but also require a lot of effort to get into and out of. In Venice centrally located means Piazza San Marco (St Mark’s Square), which is mobbed by tourists, making moving around in a wheelchair difficult. It would probably be easier to be less centrally located. There are quieter areas which are easy to reach by Vaporetto (water bus) – and there is always help around to get a wheelchair onto and off the Vaporetto. You don’t need to do a massive amount of research before hand to be able to find your way round Venice, but a couple of good maps will be a real help. First you need the Accessible Venice Map. On it’s own this map is not enough, but it is very useful for showing which Vaporetto stops can be used by people in wheelchairs. This Vaporetto map needs to be combined with a tourist map, which shows exactly where the canals are. It’s no good stepping off an accessible Vaporetto only to find that you can’t go anywhere because you are immediately confronted by a stepped bridge over a canal. Paper tourist maps (which is what we used) are easy to get from your hotel or tourist information when you arrive in Venice. Even the two maps together will not show you where there are ‘steps’. Some streets which have no canal bridges, still have steps. For example, our maps seemed to indicate that we could walk/ride from Rialto to Piazza San Marco with only one canal bridge to cross, but in fact there were lots of steps at the end of streets which prohibited us from doing this. There are plenty of quieter spaces to visit in Venice where you can still get a real sense of the place. These are the places we visited and found were wheelchair accessible. Piazza San Marco – this is not quiet. It is mobbed with tourists, but even so, not to be missed. Even the crowds can’t detract from the beauty of Venice. If it rains (we experienced 3 thunder storms in Venice) then the square is flooded – not easy for wheelchair users. The Basilica is accessible in part, if you go to the back entrance, but you still need to get up some steps – so we needed help with this. Thanks again to kind tourists. The Palazzo Ducale is more accessible. We avoided the queues by getting there as it opened on Sunday morning. Arsenale and Giardini are both accessible by Vaporetto and quieter, being residential areas. There are plenty of streets to walk/ride in these areas without crossing canal bridges and at Giardini is the La Biennale di Venezia exhibition site which is accessible to wheelchair users. We saw a wonderful architecture exhibition. Rialto on the Canal Grande is accessible by Vaporetto, but is not wheelchair friendly once you get there. The streets are very narrow, there are lots of tourist markets and the place is very crowded. We didn’t stay long. Campo San Tomà also on the Canal Grande is accessible by Vaporetto and is a lovely, tranquil place to explore, although the churches etc. were not accessible. In fact few of the churches, museums or galleries were accessible, but that’s not a problem if you are happy just to wander and soak in the atmosphere. It’s also worth bearing in mind that some of the eating places are not easily accessible. 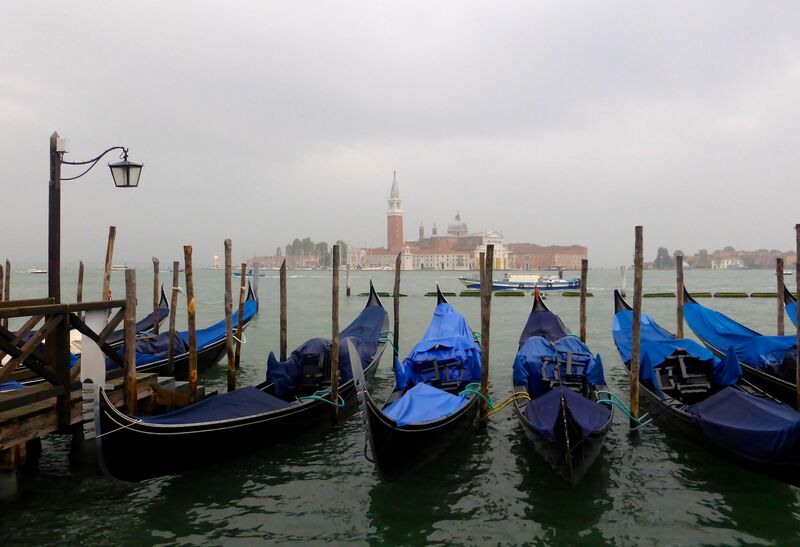 Accademia was our final stop along the Canal Grande – accessible by Vaporetto. We were there on a Monday afternoon when the museum was closed but according to their website this museum is wheelchair accessible. The good thing about this stop is that you can walk right across to Zattere on the other side where you can get a different Vaporetto to return to Piazza San Marco (where we started from) or elsewhere. Getting to and from Venice. We arrived by train from Vienna and then got a Vaporetto to Piazza San Marco which is where our hotel (the one with no bridge-free access!) was located. The main thing to remember here is to only take the luggage that you can physically carry – as you will most likely have to manage this yourself and walk some distance with it. In our case this consisted of a full sized rucksack which I carried on my back, a small rucksack for the back of the wheelchair and a hand luggage sized suitcase which we put on the wheelchair user’s knees. It would have been impossible with anything more. We left Venice by the airport Vaporetto which takes one hour twenty minutes from Piazza San Marco. There is plenty of help getting onto this Vaporetto, but when you arrive at the airport there is a 7 minute walk to the airport. Another reason to travel light. So Venice is not for the faint-hearted wheelchair user – but it is possible, and it really is one of those once in a lifetime must see places. It is stunningly beautiful and it is possible to see a lot in three days without too much hassle or rush. 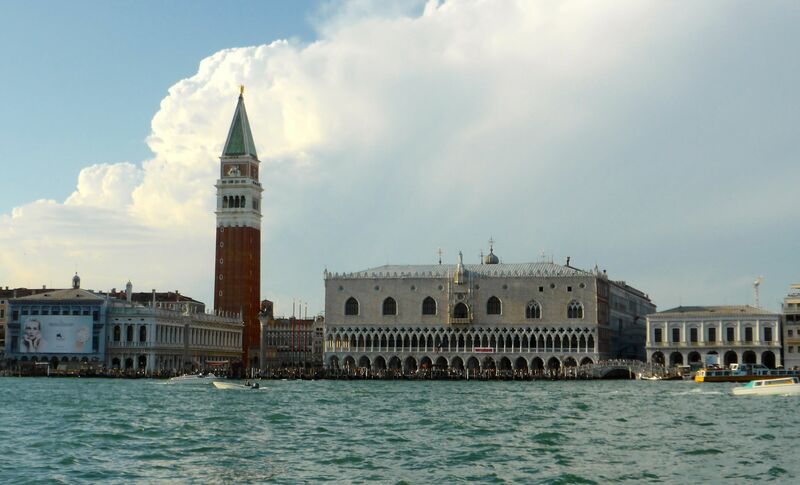 See also Venice for the Disabled – a site which provides less personal and more comprehensive advice and there are other websites which provide information, but we found that we just had to go and work it out as we went along. I’m not sure that a lot more prior planning would have helped – but that is a very personal perspective. Next Article Would Emily Dickinson have been awarded a ModPo certificate? Great article, thanks for sharing. Everyone loves Venice. Steven – One other thing I should have said about Venice for wheelchair users is that although there might be too many steps and not enough provision in the way of ramps for people in wheel chairs, at least there are no cobbles. The surface are smooth! Thank you! Considering staying a few days in Venice before a cruise with my mom who is having mobility issues so we’ll take a wheelchair to make the trip easier for her. Your insight is very helpful as I will be traveling with her and wheelchair (also will be new to her) for the first time. Hope you have a good trip Carla. Thanks for the comment.